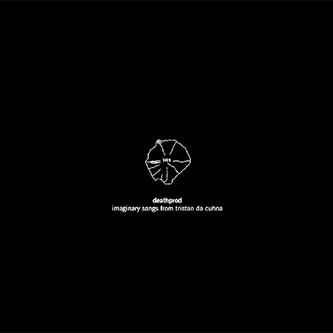 The dark interpreter, Helge Sten aka Deathprod finally relinquishes another standout part of his official canon to vinyl with a first ever pressing of Imaginary Songs From Tristan De Cunha . 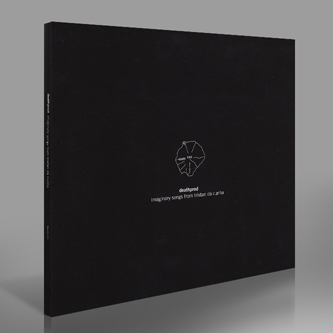 Out of print on both the original CD edition of 500 and the legendary Deathprod  boxset, Sten’s early masterpiece takes the world’s most remote inhabited island - 37° 4′ 0″ S, 12° 19′ 0″ W - as his far flung muse for a vast yet claustrophobia-inducing masterwork of dark ambient music. Trust it’s nothing less than an essential purchase along with the new vinyl editions of Treetop Drive  and Morals And Dogma . Visited by a ship carrying mail and supplies only once a year, Tristan De Cunha in the South Atlantic offers a none-more-evocative place from which to meditate on the themes of loneliness and detachment integral to Helge Sten’s music. Dispatching from this noumenal blind-spot in the consciousness of pop and literary culture, Sten emulates a sort of SOS call from he island that never reaches its intended destination and is instead left to roam the airwaves for eternity (or until a helpful alien with a great music collection passes overhead). The album was first inspired by Ole Henrik Moe, who introduced Sten to the writings of a Norwegian expedition to Tristan De Cunha made in the 1930s, and whose violin appears as a crucial element across the recordings, most specifically the first section of four parts; each recorded in the forest outside Oslo, then manipulated and transferred to phonographic wax cylinders to lend an added, suspenseful layer of decay. That first section can possibly be heard as diary entries on arrival to the island; short and wistfully descriptive notes lilting with dissonant folk melody and spare percussive cadence until the 4th part, Boatharbour Bay, which makes use of the new vinyl cut to insert a locked groove at the end of the track that perhaps cannily emulates the sinking feeling of watching the yearly supplies boat drifting back to Cape Town from Tristan’s shore, and slowly realising that you’re stuck with the same 300 people and livestock for at least the next annum. The two parts of The Contraceptive Breifcase II follow, adding five vocalists playing musical glasses recorded live by NRK at Rockefeller Oslo, plus a saw, theremin and electronics from the Audio Virus to sound something like an ensemble of Aeolian harps or primitive fog horns calling to Cthulhu. 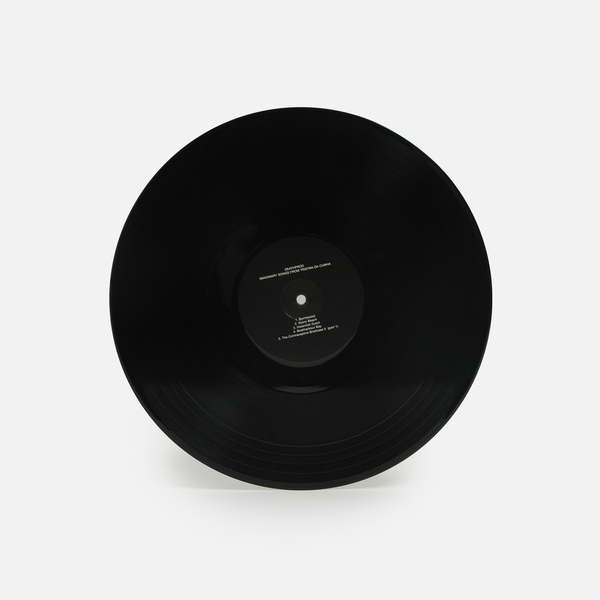 This 30 minutes, cleft in two for optimal sound quality on the vinyl, is where Sten’s time-dilating magick really comes into play, incurring an hallucinatory phantasmagoria of sound-images which, once heard or unboxed, can’t be forgotten easily. It’s perhaps a noumenal sail for the islanders to take them away, or likewise to take us there, and with a particularly ambiguous fanfare finale upon your ultimate arrival. 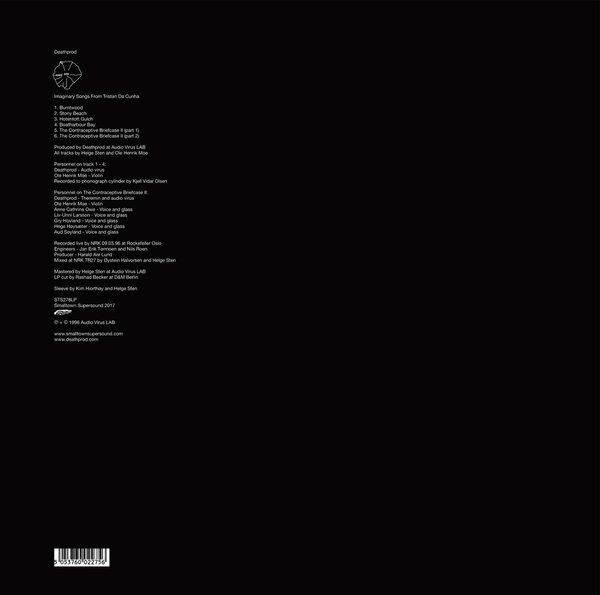 Back in stock - First ever vinyl edition. 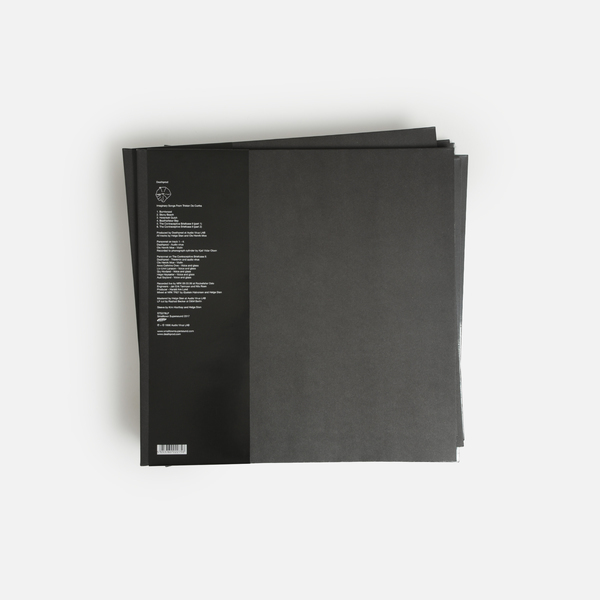 180g vinyl in matte black reverse-board-printed gatefold with lined inners and japanese obi. Remastered by Helge Stenn in 24 bit / 96kHz audio from the original tapes. Cut to vinyl by Rashad Becker.